A former officer in the German security forces, who two years ago was invited to Estonia as an honorary guest of the government, has appeared on a list of the ten most-wanted Nazi war criminals still at large. Estonia claims he is innocent. Harry Mannil, now living in Venezuela, has been implicated in the deaths of hundreds of Jews during World War II. The Simon Wiesenthal Center, which tracks Nazi war criminals, has campaigned for his extradition and trial. They claim that during the Nazi occupation of Estonia, Mannil was responsible for hundreds of Jews and Communists being sent to their deaths at the hands of the Nazis and their Estonian collaborators. Harry Mannil admits working as a political police officer during the occupation, but denies persecuting Jews or Communists. He has downplayed his police career and says he only joined “because they were looking for capable young people with a talent for languages”. Estonia has conducted an investigation into Mannil’s past, and insists that he has a “clean record”. The Wiesenthal Center labelled this investigation “a pathetic political whitewash”, and repeated its calls for Mannil to be brought to justice. 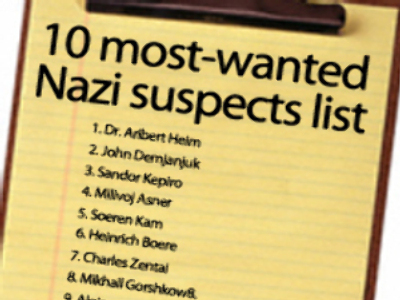 The Simon Wiesenthal Center's list of the 10 most-wanted Nazis was released on Wednesday. Harry Mannil is at number ten, accused of the “murder of hundreds of Jews” during his time as an officer in Estonia’s political police and the German security forces. The Wiesenthal Center last year criticised Estonia for removing a Soviet memorial commemorating the victory over Nazi Germany, calling the removal of the statue an “insult to victims of Nazism”.